For more than a decade now, Gyatk has been perfecting his RVCR technology-based automotive engine that will turn out to be a game-changer in more ways than one. Unfortunately, Indian automotive companies and the government have ignored his efforts, thus pushing him to find takers abroad. ‘Innovations have no real value in India’ uttered Kochi-based Gyatk RVCR Apparatus. The company has come to (after having run pillar to post over the last decade or so in trying to find a company or the government get interested in the unique Rotary Variable Compression Ratio (RVCR) technology-based automotive engine that has developed and patented by the company ) saturation and decided to bid the technology overseas.After no takers of the technology in India, the company has finally found potential investors in abroad for the engine. “RVCR is an Indian technology that can put India into the league of developed countries with its own engine invention and technology,” said Das Ajee Kamath, Chairman and Managing Director, Gyatk and developer of RVCR technology. He continued saying that, “However this chance is taking a beating. Though the government is trying hard to import the best of technologies from outside, it should also realise that no country ever gives up its core technologies. Missing out on an Indian technology of disruptive calibre in the field of IC engines and machines and letting the advantage move out of India is surely a national loss,” adds Kamath. After conceptualised the novel RVCR kinematic mechanism during his academic years at NIT, Kamath developed through time and eventually applied for a global patent in 2003. In 2005, he received confirmation from the European Patent Office (EPO) for his invention being true to novelty, inventive step, and industrial applicability. This includes quantitative and qualitative fuel control; heat and temperature control; and air/charge pressure/density control. RVCR is applicable in almost every aspect of surface and road transport, including shipping, two-wheelers, three-wheelers, cars, LCVs, HCVs, SUVs, MUVs, etc. It also has agro industry applications in tractors, power generators, material handling and special purpose machines such as fork lifts, mining equipment, etc. As such, it provides a quantum leap in combustion control by achieving analogous variation in compression ratio (CR) through a fuel range from light fuels like LPG (6:1) to heavy fuel (22:1). The CR range is unlimited and CR can be dynamically varied throughout the entire load range. It opens up the rigid constraints in IC engine and throws open entirely new dimensions in combustion control which makes the whole fuel burning process completely flexible. The compression pressure manipulation during operation opens the field for a number of possibilities. Further, the compression ratio can be varied all through the desired combustion ranges of different fuels since the compression ratio is also fuel-specific, as an example for petrol to burn inside an engine requires a CR different from that required by diesel. Engines based on the invented mechanism facilitate use of different fuels within the same engine and hence result in a multi-fuel engine. Presently IC engines are designed for burning petrol and as such cannot run on diesel whereas based on the invented mechanism this enables the changeover of one fuel to another during the running of the engine. Also, the thermal efficiency of an engine is improved by the variable compression ratio. The variation in compression enables choice between various combustion patterns, thus leading to enhanced emissions control. As Kamath explains, it also provides for enhanced fuel efficiency. Unlike in conventional reciprocating engines where two instantaneous gas volumes can never be equal in both magnitude and direction, the RVCR mechanism provides for constant volume heat addition through a finite angular range during the in gas cycle. Additionally, when the engine is switched over to diesel/compression ignition cycle, the heat addition process is switched over to constant pressure. Also, the ability to achieve higher peak pressures at low loads and reduction in peak loads helps optimise peak pressures throughout the load range. And finally it helps in downsising an engine because the rotary mechanism eliminates a number of components with respect to its conventional equivalents; hence resulting in smaller and more compact engines. The product was one of just 8 innovations amongst 1,000 competitors to win the India Innovation Growth Program (IIGP) Gold Medal from a panel of experts in technology commercialisation appointed by the IC2 Institute of The University of Texas at Austin. Kamath was also felicitated at the Global Clean Tech Open in San Francisco 2014 and RVCR engine technology was selected by UNIDO (United Nations Industrial Development Organisation) as GCIP (Global Clean Tech India Program) winner to represent at the global competition of Global Clean Tech Open in the US. By 2010 Gyatk had successfully carried out a technology grounding sense check exercise at the highest platform, namely the Engine Expo at Stuttgart in Germany, which led to a major engagement in the product development project for commercial use. “We, however, cannot reveal the name of the client due to a confidentiality agreement,” says Kamath. Gyatk is currently on course to standardise its technical and business operations for preparedness towards undertaking multiple parallel product development projects for further expansion of its market base in various applications of RVCR technology. “We are seeking strategic investments and partnerships in our product development projects and business expansion process. We have exclusive 100% ownership of IP rights by way of granted patents in 51 countries worldwide for a disruptive high potential multi-faceted invention. A global automotive major has been our first strategic customer licensee of technology. 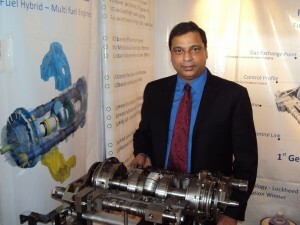 With no prior existing standard technology development scheme, Gyatk demonstrated its capability of taking the concept to end product from design conceptualisation, modeling, mechanism development and analysis, manufacturing, assembling and testing to satisfactorily project the viability of RVCR for gaining the confidence of its first customer licensee, thus proving our engineering credential,” Kamath informs. VCR engines are not new. Both Nissan and Porsche have them. I looked at the company website. The Inventor should stick to Automobile engines. When he talks about wind energy using differential pressures on the roof of a house and its base, it is clear to anyone who is conversant with the field that this technique will not generate a lot of energy. It shows that Inventor’s lack of understanding about wind power and Fluid Dynamics. He does great disservice to his otherwise, interesting product. I wonder, if some potential investors, after reading, the “treatise” on wind power are doubting the rest of the Inventor’s message. As an individual, who in the past and recently, conducted Technical due diligence on startups, I am cautious when I read a description that has such bombastic claims. Blaming the Indian Investment community for lack of interest, in my opinion, is a Red Herring. I did not see this comment previously, and was brought to my notice by a friend now. VCR as a concept is well known in the industry and were 1st tried by Harry Ricardo in 1920’s, and there have been more than 2 dozen models. The latest being from MCE 5 of France and by infiniti. However all these models were and are based on crank mechanism and most of them have remained test models and never been commercially viable. This is because the crank mechanism complexities which makes it extremely cumbersome. The RVCR Engines are based on a entirely novel kinematic mechanism which is much superior to the crank mechanism and makes VCR Engines Viable. With respect to Wind energy application pleas note the following. RVCR is a Rotary Positive displacement Mechanism which allows Variable Volume control of the fluid Spaces during cycles and applicable to fluid handling machines. I see that you have commented about pressure differential between roof top and basement. Please not that the concept is about pressure differential is created by converting the wind flow energy into pressure energy using a venturi and you would know that the basement of buildings are near earth surface and hence stagnant due to factors of surface obstructions. You may please refer to the stream line flow systems. The said differential is higher at windy places and also as the height of Hi-Rise increases. A rotary turbine would not be able to tap into this differential, however RVCR based motor can. In case you want any other details and clarifications please contact me directly, and I am sure you would have a better understanding of our claims and I am sure you will see good reason for Investing in our proposition. I am not sure how you have carried out due diligence on RVCR with out contacting us and generalizing the claims being bombastic based on statistics is not appropriate. We would appreciate a more responsible approach towards the RVCR proposition if you want to engage.